making figure eights with a wooden spoon. or the lonely neighbor invited out of duty. its little boat, waiting with mouth open. gravy, into your mouth, hum under your breath. delicious every thing it covers. 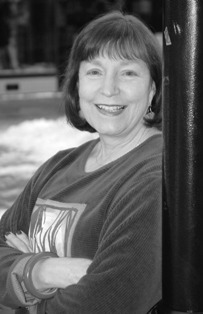 Barbara Crooker, is the author of ten chapbooks, three full-length books, and more than 700 poems published in more than 2300 publications. She credits her achievements to perseverance as much as talent, and says, "Writing poetry is not putting down whatever comes into your head, and leaving it at that, never taking it any further. Poetry involves layers, and a lot of revision." Barbara lives in Fogelsville, Pennsylvania, where she will be making gravy for her family that includes two vegetarians, two non-wheat eaters, two non-dairy eaters, and a grandchild who is anaphylactic for nuts (especially peanuts) and eggs. Read more about her at www.barbaracrooker.com. yummm. Even the day after T'giving this is perfect. "incorporate them in the mixture, like a difficult uncle or the lonely neighbor invited out of duty"...let me be the third person here to call out those lines! Love this poem, Barbara. Happy Thanksgiving to all my USAmerican neighbours! Barbara, you are a gift to my life...beauty and grace in everything, even the holy family of gravy. Thanks on Thanksgiving for sharing your gifts so generously. Ah, Barbara, "Gravy"! Smooth and rich. Delightful. I, too, love the line "incorporate the difficult uncle or the lonely neighbor invited out of duty." Also the passing of the baton and the "bubble and seethe of it." Happy Thanksgiving! I love this poem, especially where you say to ...incorporate like a difficult uncle or the lonely neighbor invited out of duty...!! "Gravy" is every bit as good as it was when I first read it. Thank's for this re-issue--the perfect poem for the day!